"The whole government quarter is shielded out." 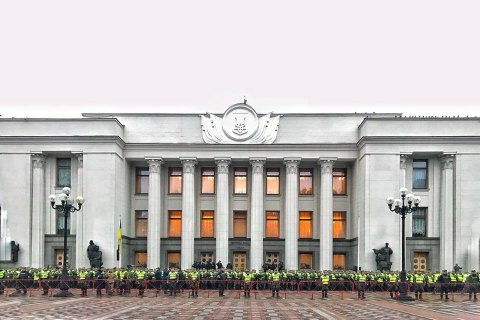 The National Guard and the police cordoned the building of the Verkhovna Rada, Cabinet of Ministers and the Presidential Administration in the morning of Tuesday, 17 October ahead of a protest rally. "The whole neighborhood is surrounded by police shields. The passage to Constitution Sq. is only through metal detector frames. The parliament building is surrounded by a double chain of National Guards and police," MP Mustafa Nayem wrote on Facebook and posted photos. A large number of parties and political forces have stated plans to stage a rally in Kyiv demanding political reform. Among the participants are the party Movement of New Forces, Self-Help, Freedom, Citizenship, Alternative, Demaliance, and National Corpus. Organizations Honestly, and the Reanimation Package of Reforms, Khvylya movement and others have stated in support of the rally. Among the key requirements of the participants of the rally are the change of the election system in Ukraine, particularly, transition to a proportional system with open party lists, the restriction of political advertising on television, creation of an anti-corruption court, and the abolition of parliamentary immunity. The rally will take place on the square in front of the Verkhovna Rada and on the adjacent Hrushevsky St..
Kyiv authorities blocked traffic through the government quarter ahead of the rally.